In 1986, Hasbro and Takara expanded their already-fruitful working relationship by co-creating a new toyline. 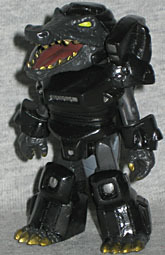 In Japan, it was marketed as an expansion of the Headmasters series and called Beastformers - in the US it was a standalone line known as Battle Beasts. It was all about little anthropomorphic animals in armor fighting each other in an elemental game of rock, paper, scissors using fire, water and wood as the stand-ins of choice. The line was mildly popular (for a property that never had a cartoon or [US] comicbook), but was quickly forgotten. At SDCC 2009, however, Diamond Select Toys announced that they'd acquired the rights to Battle Beasts - not just a license from Hasbro, but ownership of the actual brand. The first toy was to be a spirtual update to the old Battle Beast #15, Gruesome Gator (Alligatron in Japan), or #112, Dino Gator: an alligator in armor. The plan was to release him with a cardboard Laboratory Playset, available at the end of that year. Then it was pushed back to March '10. Now it's been pushed back again, possibly all the way to 2011. Basically, if you were waiting for that one, don't hold your breath. Fortunately, there are alternatives. If you were one of the folks lucky enough to go to the 2010 Toy Fair, like our newsman Sprocket, you could get a silver version repackaged with Ares' sword. And if you attended C2E2 (or, apparently, the Diamond Retailers Summit), you could get this black one. The idea behind DST's Battle Beasts is more a "reimagining" than a direct update. Yes, this is an alligator wearing armor, but he's not Alligatron; the armor covers the same parts of his body, but it's not like any of the shapes are the same. 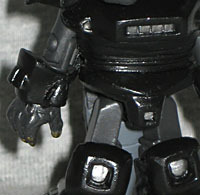 The base of the figure is a standard Minimate body, sans hands and feet: everything else is created by add-on pieces. 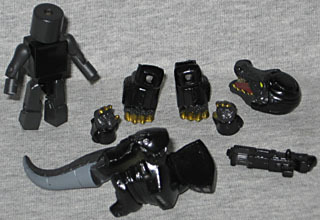 Once he's all together, the figure stands about 2½" tall, and has all the usual 14 points of Minimate articulation (though some of it is slightly restricted). The armor provides a lot of bulk, but the exposed bodyparts - the arms and upper legs - end up looking very spindly by comparison. While the other two gators have a nice contrast between the skin and armor, this guy lacks it: he's dark grey, and his armor is black. Yes, the difference shows up very well in a camera flash, but in normal lighting, it's tough to make out. His claws and teeth are gold, his eyes are yellow and there are silver accents on his armor. The underside of his tail is a lighter grey. 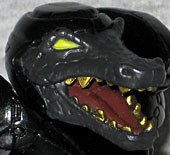 The Alligator Battle Beast's head is created by putting a new, complicated "helmet" over the standard Minimate head - certainly beats trying to do it all with paint, yeah? Surprisingly, there's a difference between this gator and the others: his mouth is open wider. Yes, that seems like a minor thing, particularly since the lower jaw is just glued onto the rest of the head and thus some variation is to be expected, but so far every sample of the yellow and silver figures I've seen have had their mouths closed, and every sample of the black one has had it open. Odd, isn't it? At least it gives you a better view of his sculpted tongue and the roof of his mouth. Like we said, the Toy Fair figure came with a sword, but the C2E2 version has a gun. It's a blaster that was originally included with the Series 32 Cable, cast in black plastic. He can hold it and aim it well, which is good, since there's no peg or anything to attach it to the armor like Cable had. He could really use one of those waist-extending pieces, because if you push the hips all the way into the torso, his tail, a molded part of the armor, reaches too low and pushes him slightly forward - a problem that's erased if you leave the hips out slightly, and thus, one of those tall waists would really hit the spot. There is one thing missing from this figure. Remember how we said the Battle Beasts fought each other with the powers of wood, water and fire? Well, each figure had a thermoreactive "rubsign" that revealed which power they had. Since "humanoid animals in armor" isn't really a unique enough idea to be copyrightable, DST could have done this sort of toy at any time. What they got from Hasbro was basically the right to use the "Battle Beasts" name and logo, not the rubsigns or elemental roulette. Why buy it, then? Because the name makes the toys immediately recognizable and gives them a retro cachet. Hopefully Diamond will actually manage to turn the Battle Beasts into a full line - after all, if Target can sell Gormitti (which are to Battle Beasts as Power Rangers are to Voltron), they could sell these superior figures. Make 'em part of a game or something, sell 'em to the Bakugan crowd. Whatever they do, let's all hope that eventually they get more out the door than this one mold.